What I learned at the Fall DECA Mock Competition was amazing. You’ve just started a small home delivery company called Dinner Drop, that brings freshly made meals to your customers’ door. You have a cool App, but you also have two competitors – one that is entrenched in the local college scene, and one that caters for young professionals, but limits itself to an 8 mile radius from its base. Your business partner has asked you to look at competitive market strategies, to profile your target customer, and to identify ways to reach them. You have ten minutes to prepare a five minute presentation…. …so you must be at the DECA Fall mock competition in Bellevue! Fortunately, however, as a judge we get to sit on the other side of the table as a parade of ‘business partners’ pitch their marketing strategy to us. The very best thing about the mock competitions is that you get to pontificate…or as it is politely referred to, as ‘giving feedback’ to a fantastic parade of enthusiastic and engaged high-schoolers. My ‘DECA ninja secret’ is a tip to use visual aids in place of notes, that I never tire of explaining to this captive carousel of contestants. The other great thing about DECA is your co-judge. In my case, this was Andy – a business development lawyer from AT&T. It turned out that Andy had done several years as an independent consultant, while I’m still struggling to establish my practice. He told me about how his marketing approach had been to develop very close relationships with just a few complimentary service partners, each with a different specialty. His strategy during a client engagement had therefore been to pro-actively work on ‘passing the baton’ to those partners, and to teach them how to pass the baton back to him, just so he could pass it back to them, and so on ad infinitum. In my own consulting business I’ve been working on developing strategic marketing partnerships, but I hadn’t thought of going that in deep – I hadn’t thought beyond the first baton pass. He was talking about creating a self-sustaining model. He got to the point where he could pitch his partners better than they could themselves. Something to think about! On my way out of the Hyatt Regency I stopped to get my shoes shined from Jerry. Jerry is coming up to his first year anniversary as an entrepreneur after 15 years working at Nordstrom. What had Jerry learned in his first year of business? “I should have done it sooner” he answered. “I spent too long being afraid to give it a go.” Indeed. You’ve missed the Fall Mocks, but the Spring competition is just around the corner – it’s normally towards the end of March – no qualification required except a willingness to listen and learn! The BBRC normally sends about 5 or 6 judges to these events, which are held right here in Bellevue. The Fall mock contests are, in my opinion, more fun to judge than the Spring competition because the kids are more relaxed and you can talk to them about how they could make their presentations even better. 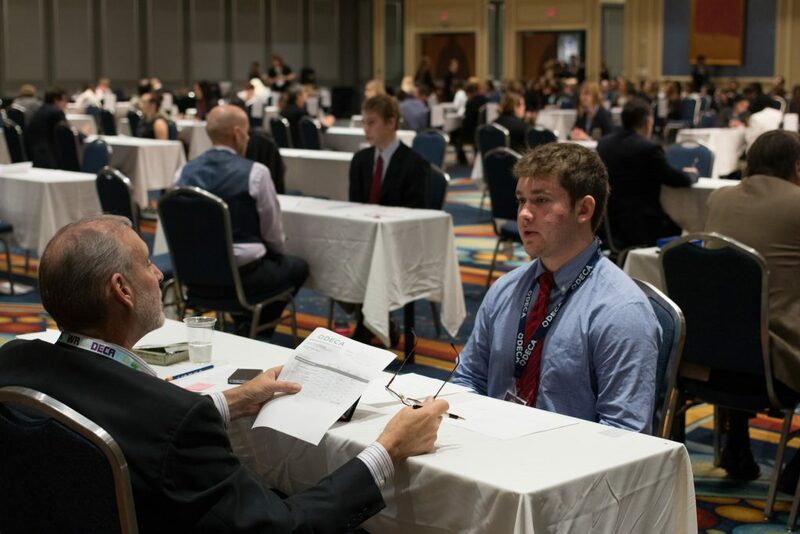 Washington DECA needs 200 business professionals to judge the Fall Leadership Mock Competition on October 31st from 7:30 – 11:30 a.m. at the Hyatt Regency Bellevue.